Steven (Chicagoland, United States) on 23 September 2009 in Architecture and Portfolio. The Trump International Hotel and Tower, also known as Trump Tower Chicago and locally as the Trump Tower, is a skyscraper condo-hotel in downtown Chicago, Illinois. The building, named after real estate developer Donald Trump, was designed by architect Adrian Smith of Skidmore, Owings and Merrill. Bovis Lend Lease built the 96-story structure, which reached a height of 1,362 feet (415 m) including its spire, its roof topping out at 1,170 feet (360 m). It is adjacent to the main branch of the Chicago River, with a view of the entry to Lake Michigan beyond a series of bridges over the river. The building received publicity when the winner of the first season of The Apprentice television show, Bill Rancic, chose to manage the construction of the tower. Trump announced in 2001 that the skyscraper would become the tallest building in the world, but after the September 11, 2001 attacks, the building plans were scaled back, and its design has undergone several revisions. When topped out in 2009, it became the second-tallest building in the United States after Chicago's Willis (formerly Sears) Tower. It is expected to be surpassed by the Freedom Tower in New York City in the middle of 2013, and by the currently on-hold Chicago Spire if completed. 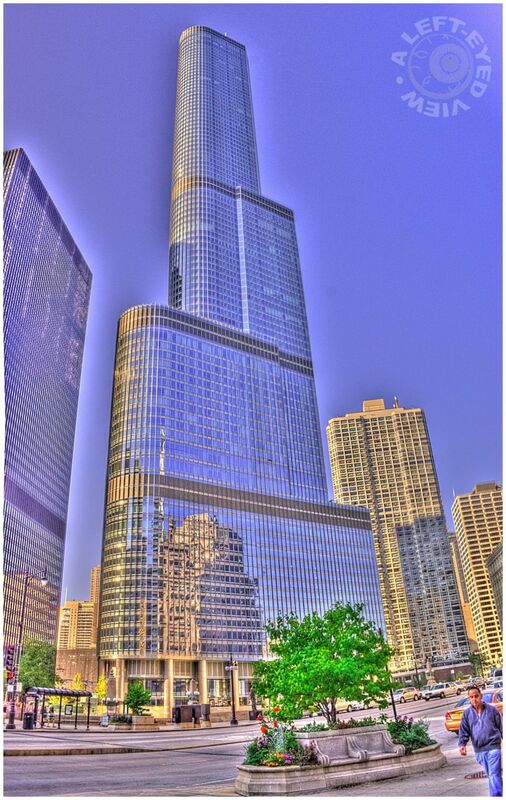 Trump Tower surpassed Chicago's John Hancock Center as the building with the world's highest residence above ground-level and will hold this title until the Burj Dubai claims it. The design of the building includes, from the ground up, retail space, a parking garage, a hotel, and condominiums. The 339-room hotel opened for business with limited accommodations and services on January 30, 2008. April 28, 2008 marked the grand opening with full accommodation and services. A restaurant on the 16th floor, called Sixteen, opened in early 2008 to favorable reviews for its cuisine, decor, location, architecture, and view. The building topped out in late 2008 and construction was completed in 2009. Really thrilling HDR. Works so well with metal and glass. Which application are you using for your HDR PP ? @zOOm: That would be Photomatix. I have also heard of a program called Topaz Adjust that I will be trying out soon. Both programs have a free trial version. Another amazing picture from what must be quite a short lens. Interesting background - fantastic photo! Wow .. fantastic POV and perspective ! Another amazing picture,spectacular projection ! It's great to see Chicago in HDR! Nice job! extraordinary -- faaabulous detail and reflections!! what a building! !